Shiraz Viognier by Heathcote Winery of Heathcote. Brooding in style, medium to full bodied wine showing dense regional fruit and impeccable balance. One of the earliest commercial winemaking operations ever established in Victoria. Exclusively Heathcote Shiraz is treated to a Rhone styled co-fermentation with a small amount of Viognier, lifting the colour and infusing the aromatics with wonderful apricot floral scents, while adding body and increasing palate structure. High end French oak contributes to a tasty, supple tannin profile, concentrated primary fruit suggests added complexity as the wine continues to evolve. Not many country towns can boast a winery in the main street, but at Heathcote it's a part of the scenery. Visitors to the cellar door enjoy free wine tastings and a range of locally produced foods, or may simply stroll through the Art Gallery, which features exhibitions by regional artists. The courtyard offers free BBQ facilities and is a great place to unwind with a glass of wine or your favourite coffee. Functions can be catered for in the Art Gallery and courtyard. The Central Heathcote area, with its own unique micro-climate, has the ability to produce shiraz styles with power and elegance, wines with voluptuous fruit whilst young, tending towards the dark red fruit spectrum, yet avoiding stewed characters. Natural tannins seem to find their balance, adding length to the palate. Winter rains are followed by cold spring nights, a little more rain, and then warm dry conditions through to harvest. The Heathcote red soils, deriving from Cambrian greenstone, are free draining and a touch hungry. Yields are naturally low. Heathcote's a tough area to grow grapes. If it was easy, then you wouldn't get the quality at the end of the day. Enormous frosts or wildcat fire seasons can completely wipe out a vineyard. An entire vintage can be reduced to a few barrels of wine. Through painstaking vineyard management, low but realistic yields are achieved, producing ripe small berries that result in fruit with concentrated flavours and naturally balanced tannins. Fruit is picked only when it is ready and that means flavour ripe. The decision is made in the vineyard, not the laboratory. 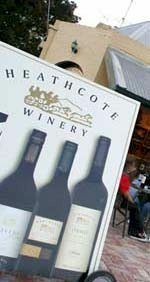 Heathcote Winery produced its first vintage in 1983 and now specialises in the release of outstanding local wines. Shiraz is the cornerstone of Heathcote Winery's premium wine production, Mail Coach Shiraz was awarded Top Gold Medal in its class at the Royal Adelaide Wine Show against 240 other wines. Today, Heathcote Winery is meeting the demand for wines that are truly reflective of the region, with the estate’s individual stamp of innovation and excellence. In 1997 the winery was acquired by an independent group of wine enthusiasts led by Stephen Wilkins. Stephen and his partners share a passionate commitment to produce wines reflective of the Heathcote Region but distinctly Heathcote Winery. The wines attest to this commitment, delivering concentrated fruit aromas and flavours and intense colour. Heathcote Winery splash their shiraz with viognier, in a Rhonesque way, but in definitive Heathcote styling, which gives lifted aromas and palate length without compromising the naturally concentrated shiraz flavours. The aim within the winemaking process is minimal intervention, allow the wine to speak for itself. Viognier harvested from some of the earliest plantings in Victoria, is gently whole bunch pressed for refined varietal expression, and is added to the shiraz for co-fermentation. The individual parcels are plunged by hand or through press as required to enhance flavour development, elegance and mid palate richness. The Heathcote Winery's wines are aged in carefully selected American and French oak to complement, but not to overpower the natural tannins and fruit flavours in the wine. The pioneers of Heathcote sowed the seeds of some of the world's most superb shiraz vineyards, reflecting minimal intervention, and the natural attributes of the local climes. The Heathcote Winery team share this passion to produce great shiraz, combined with the individual handprint that stamps their wines as distinctly Heathcote Winery Heathcote Shiraz.